Glam Morena: Get An $80 NARS Credit For Only $50! Get An $80 NARS Credit For Only $50! I found out about a deal I felt was worth sharing. Thanks to Kim for the heads up. 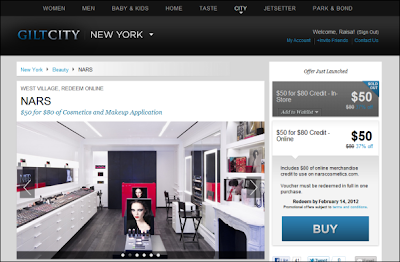 Gilt City is offering a really amazing deal for NARS Cosmetics. NARS is one of my favorite brands, especially their powder blushes. You can get an $80 online credit for only $50! Best thing of all if you click here to sign up to Gilt City you will receive 20% off your first purchase! Bringing your total to only $40! Also be sure to sign up to Ebates to earn 4% cashback on your purchase. Fine Print: Offer is final sale and nonrefundable. Offer must be redeemed by February 14, 2012. Limit one per person. Offer valid only on narscosmetics.com. Voucher must be redeemed in one purchase. Voucher cannot be combined with any other offer. Voucher cannot be resold. Voucher is not redeemable for cash. After purchase, you will receive a Gilt City voucher via email with a unique six-character voucher number. Please wait until you receive your official Gilt City voucher to contact the vendor and redeem this offer.